So I took this picture, and after I took it … I guess this goes to interpretation and structure and the form of our time. I realized that I was structuring this in a very classical way, with one-point perspective, with things that are setting up the frame and setting up the foreground and I had fun doing it. I was going through a period of seeing how densely I could structure a picture and how far back into the picture I could look and how much I could set up all of this complex picture structure. At the same time I'm thinking, show the very age and body of the time, this form and pressure. Is this it? Or is this a structural understanding that I'm bringing to it that isn't inherent in the scene? I went back to the same intersection the next day and took this picture, which is looking this way towards the other part of this intersection. DH: It's a completely different picture; hardly even recognizable as the same intersection. SS: And it feels more like the photographer is hardly doing anything. DH: The one feels like a very complex structure and this other feels less so. More like a casual snapshot. Do you feel like this shows the form and pressure of the time? SS: I do. At least that was the direction my thinking went for the next year or so. Shore had to have known Ruscha's painting, in which case it seems too much of a coincidence that he'd include a Standard sign. When he critiques his own photo as being shot in "a very classical way, with one-point perspective," I can't help thinking he's also talking about Ruscha. Just speculation. 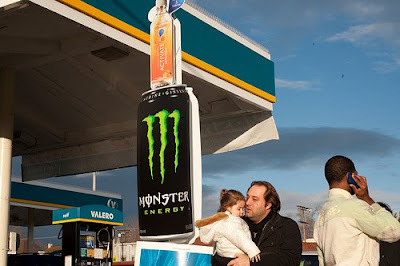 Of course gas station images have a long tradition in photography, so he may have been commenting on the whole genre. 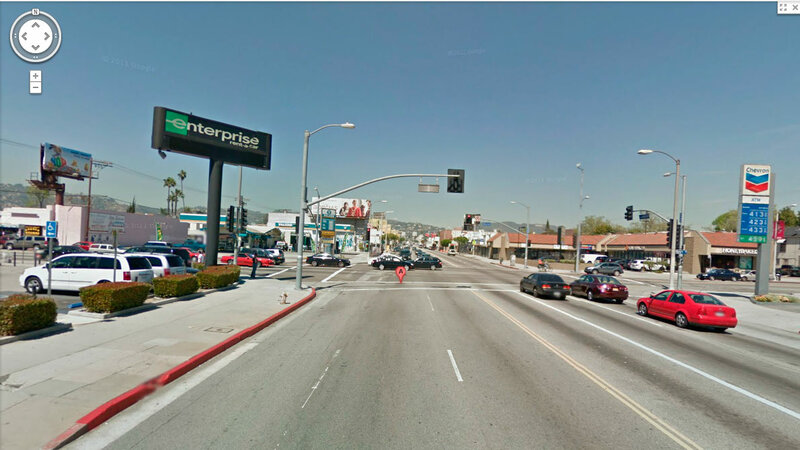 In any case, great intersection. Landmark photos. And how many locations can claim to have inspired their own photographic project? That's right. 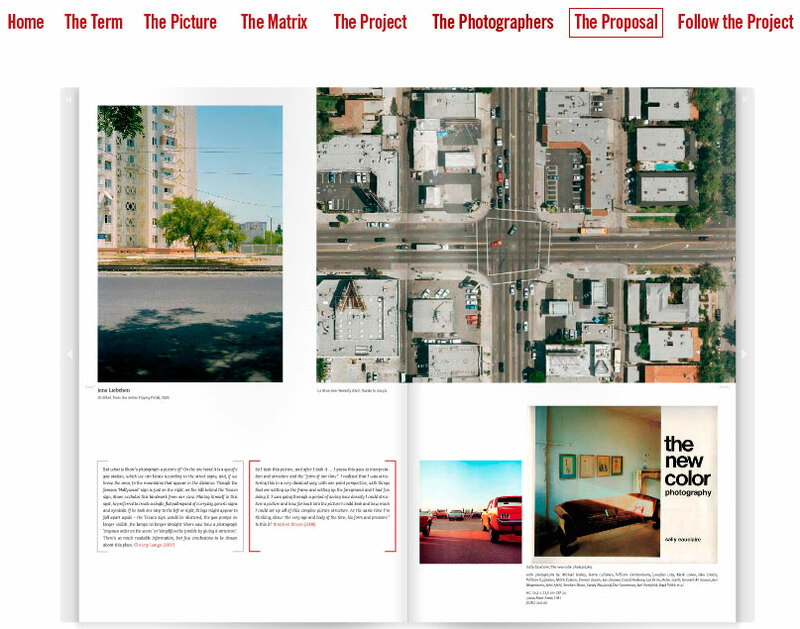 La Brea Matrix has spawned a cottage photo-making industry around Shore's shot. 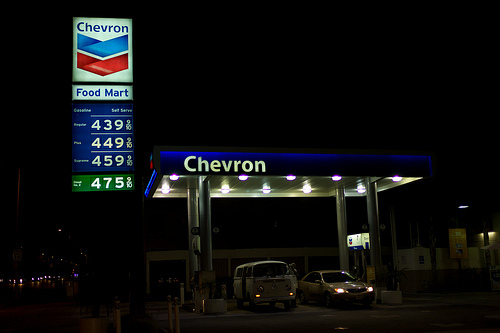 Six German photographers have been commissioned to shoot LA in the spirit of the Chevron sign. It's been going now for a while but I only recently tuned in. One might expect some cross-pollination with this project but as far as I can tell they're two separate endeavors. I guess Germans just dig Shore. Meanwhile, the original photo quietly reverberates. 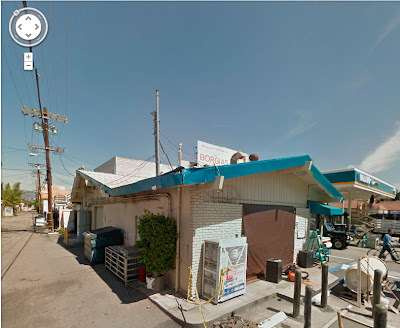 As far as I know Dalton Rooney was the first to examine it through Google Streetview. Whew. Talk about one-point perspective. Too classical. Maybe I should go back tomorrow and rephotograph. 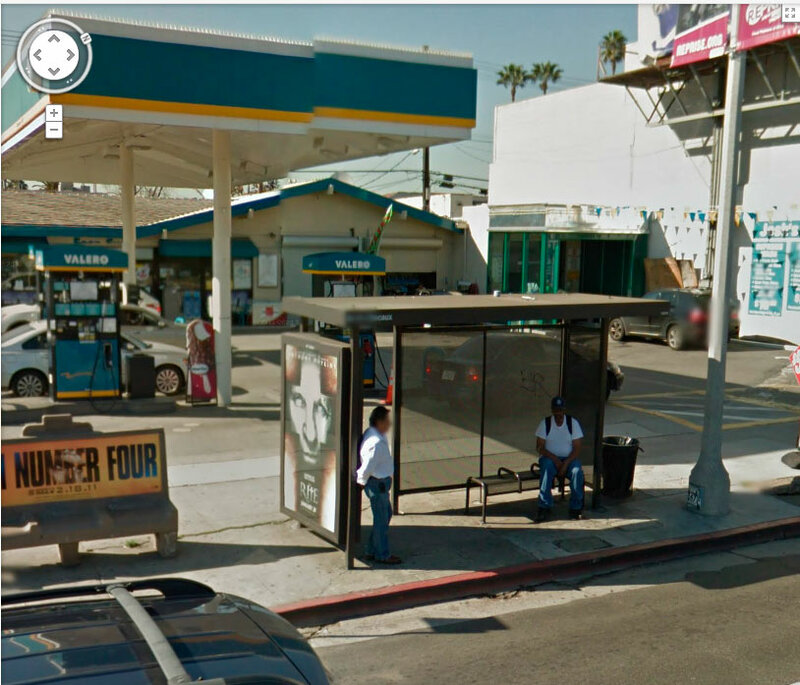 Here's a cleaner view, a recent boots-on-the-ground reshoot courtesy of Ted Soqui for LA Weekly. That's all fine and dandy but the real action is happening at the Valero Station across Beverly Boulevard from the famous Chevron (straight ahead past the sign in the original photo). It's not so much the station itself which is interesting but the surroundings. They're dense with urban detritus. 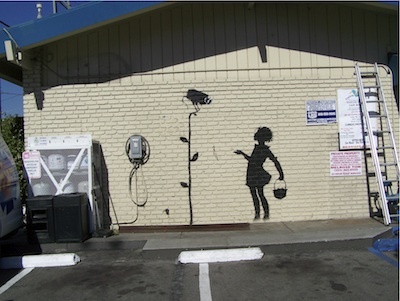 Apparently Banksy made the mural while in LA for a wedding and got permission beforehand from the owners. Now it is slated for removal and/or possible relocation. Don't ask me how one removes a spray painted image while keeping it intact. 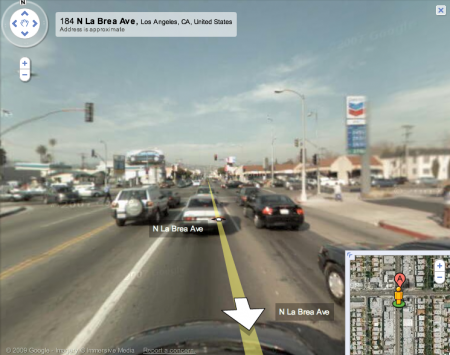 This Streetview image from yesterday shows it covered up while powers-that-be try to decide its fate. Here's a Streetview photo to locate it mentally. The green wall in back is the one near the Banksy mural. For folks that actually live in LA I think these murals must be fairly well known since there are many photos of them online. What I'm curious about is did Banksy target that location specifically because of the Shore photo? It seems likely that he would have at least a passing familiarity with Shore's photo. And if so, maybe the paintings are some sort of reaction? Who knows. Only Banksy and he's not telling. The alternative explanation appeals more. I like to think that Shore and Banksy found this intersection completely independently, and each reacted to it in his own way. That would imply that there's something going at that the site —some spirit of LA embodied in the matrix of wide open spaces, small boutiques and gas stations— that attracts certain artists. In all the hundreds of square miles in the city, two artists zeroed in on the same place. That's how it went down in my mind at least, but then again I've never been to that corner in my life. 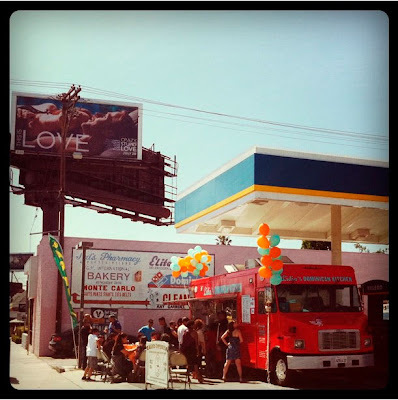 Excellent post Blake and very hearty in photographs and back-story information. I was aware of the La Brea Matrix project for some time now. Read in Foam last year. Even though the project seemed quite promising & inspired, I was a bit puzzled by the conceptual twist given by some of the participating photographers. Some works seem to me too far stretched out from the inspiring photo. Interesting post Blake. Thanks for the Banksy reference. I find the whole Banksy mystery endlessly fascinating and he or his art seems to pop up in some very interesting spots. For me, the problem with Stephen Shore is that I don't enjoy looking at his photographs. I purchased "American Surfaces" and the book feels like I'm being forced to view someone's vacation photos - all 300 of them! Have you tried rephotographing his vacation on Google Street View? I think Shore can be tough to approach. 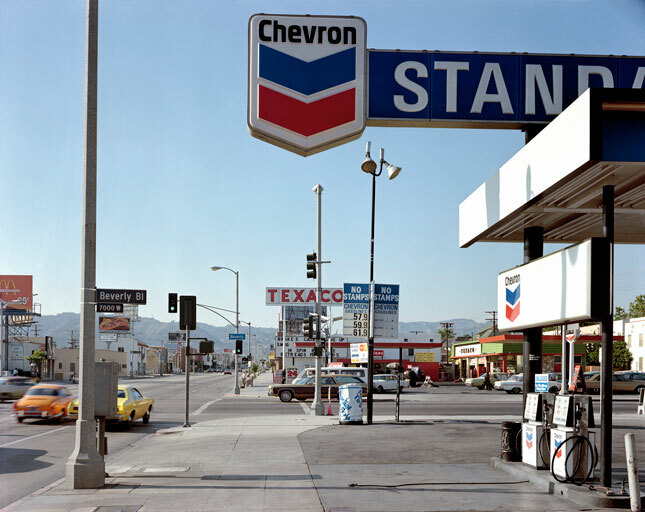 There is quite a difference between American Surfaces snapshots and the later stuff like the gas station photo. And I have to admit I find his even later stuff like Gardens at Giverny unappealing. But for a few years there in the mid 70s he seemed to find a groove shooting scenes in completely dry documentary fashion while at the same time with extreme precision and exquisite sense of place. Uncommon Places still entertains. I can still find new things in it. 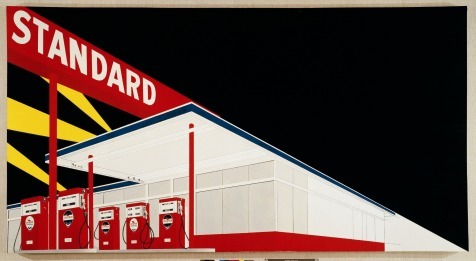 I also love his Amarillo postcards. I think in the long run they may be his most important work, or at least the most forward looking. That night shot is a different view of the station - It's facing East looking down Beverly. 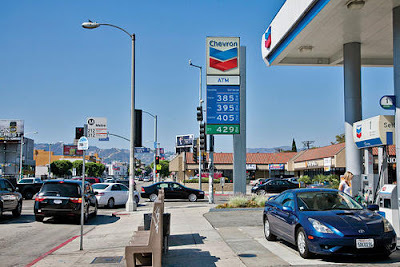 I boycott that Valero station hard but often fill up at the Chevron. 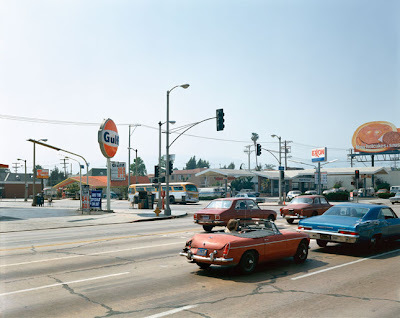 I had Stephen Shore as a professor at Bard college. He taught us that when you're photographing a person's face that you should focus until you can feel their brains with your teeth. I'm not sure what else you need to know about the man. I've often wondered why there were so few pictures of people in Stephen's work. He's clearly a cannibal. Oh my word. Talk about old school! Love it...i wish i could relive those times and get great shots. Unfortunately, my skills developed way after.